I have a feeling that this is the final book from that Humble Bundle that I had, and I'm rather chuffed with how the whole thing came out. I went into Signal to Noise with fairly positive expectations, as I've enjoyed what I've read of Neil Gaiman's work thus far and the comics that he's been involved with usually end up looking weird and beautiful. I couldn't seem to get a blurb that mentioned anything about the plot itself, only the rave reviews and the fact that there's a radio drama adaptation, but I've gone into a couple other books on this bundle with similarly vague notions of the premise and come out fine. Besides, if it sucked at least it was under 100 pages. Signal to Noise follows a director in the months after he is diagnosed with cancer. As he refuses treatment for the malignant tumour, he begins work on his final film, the finished product that he doesn't expect to live to see. As he crafts a story about a village waiting for the apocalypse to come at the stroke of midnight on December 31st, 999 AD, it starts mixing with his thoughts on his own personal, imminent apocalypse. I kind of regret reading this on a tablet. While my tablet is okay for text, I think I needed to read Signal to Noise as a physical book. Because this is a beautiful comic book, and I don't think reading it on a tablet did it justice. I want to see the weird, angular depictions of the horsemen in that lovely glossy paper that decent comics are printed on. I want to be able to stare at the pages and really see the transition where the focus on the crowd zooms further and further out until you're looking at the creases in a man's palm. 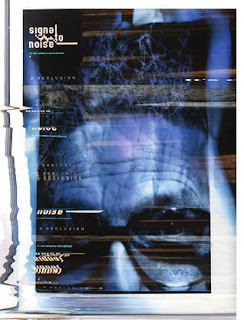 Signal to Noise, much like the world cinema films that it seems to be paying tribute to, is one of those pieces that is both beautiful to look at and never seems to stop being interesting in its subject matter. I don't want to say too much about the plot itself, as it's more a character piece and it's an experience that I don't think I can convey with the sort of grace that it deserves. Just read it.